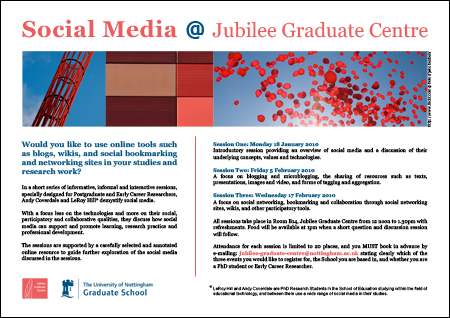 Yesterday, me and LeRoy Hill ran the first of our sessions on social media at the Jubilee Graduate Centre. 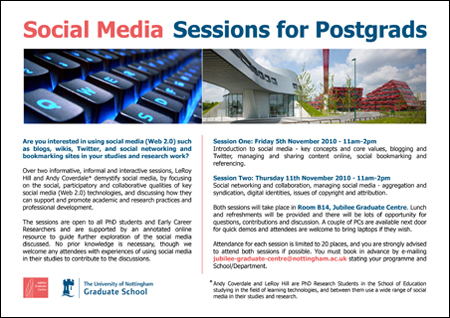 We had an interesting mix of PhD students and Early Career Researchers attending from a range of Schools across the University who were very supportive and enthusiastic about using social media in their studies and research. We did run over schedule, particularly as we wanted to engage with the audience and encourage group discussion, though we would like to have had even more time for this. The general feedback from attendees was that they would appreciate more interaction and would be happy for longer sessions if necessary. It was always going to be a struggle fitting everything into three short sessions and we will keep this in mind should we be running these again in the future. Meanwhile, much of the planning for the second session has been done though we have over two weeks for fine tuning. We are intending to cover blogging, Twitter, content sharing sites and social bookmarking, as well as aggregation and syndication systems. It’s going to be tough to fit so much in if we hope to integrate further opportunities for discussion and interaction! We also launched the online resource which supports the sessions. This was a key component in our initial proposal particularly as the limited time of the sessions was always going to restrict opportunities to demonstrate specific tools. 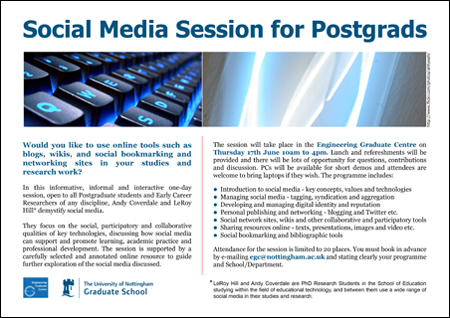 In addition to the annotated links to key social media we have included a useful selection of tutorials, guides and articles with an emphasis on academic practice. This resource will remain active after the duration of the sessions, and we are hoping it will – along with the sessions – provide a basis for further development in this area.